Hello, I’m asking something for a friend who is starting now with SGP but is not in the forum yet. He uses SGP v3.0.3.169 on Win 7/64 bit. 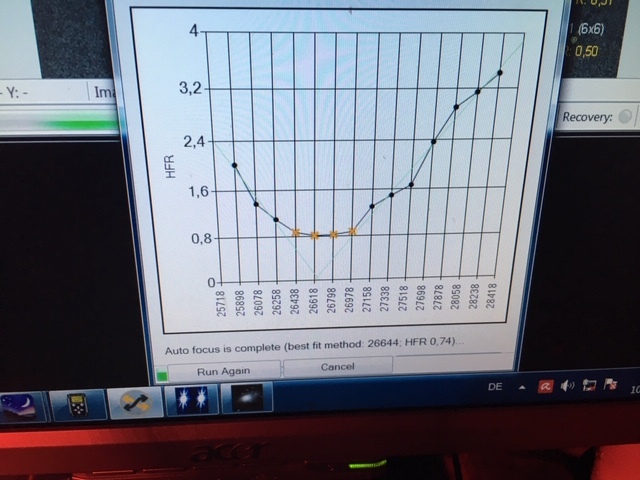 He has already made some successful attempts with SGP, but a few days ago the following happened: the autofocus process was completed successfully, but the graphics window did not close. Normal - adjustable - you can specify when the graphic display should close, but nothing like that happened. It only worked “Cancel” and “Run again”. Even a program restart did not succeed. As I said: no matter what time was set for closing the window. The only possibility was “Cancel” and manually enter the value found, he wrote to me. Does somebody has any idea??? Once complete it should have the option to close. I wonder if font scaling is messing up his window so that the forms look “weird”. If you can post a screenshot when the issue appears that will be helpful. Yeah, looks like it completed successfully. That looks like something is wrong with the window scaling. The buttons appear to be getting pushed down and the “Close” button is hidden. Ok, first of all thanks, especially from Karl, he will check that at the next opportunity. I would like to announce myself again and communicate the results, can it be that it is interesting for the group? Hello Jared. A warm greeting and heartfelt thanks from Karl: You were absolutely right with your problem solving, it was due to the Windows screen setting.